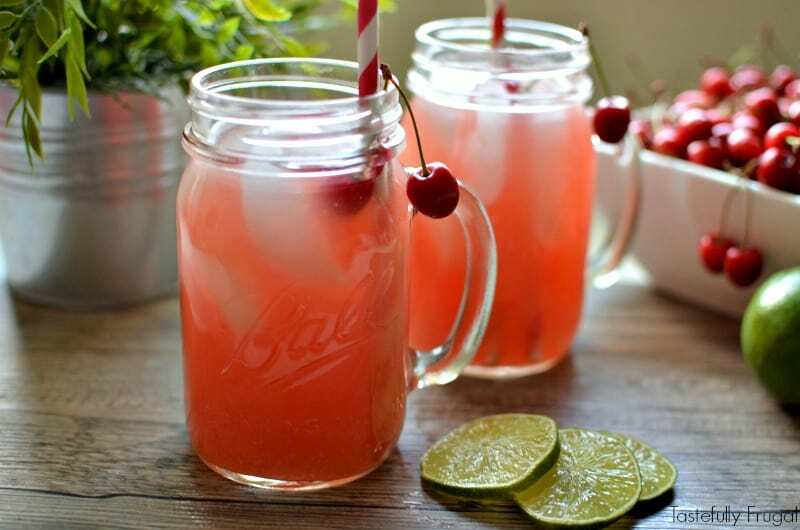 Make sweet limeade with fresh tart cherries and limes. Have I mentioned before how much I love fresh fruits and veggies?! I love them even more when I get to pick them straight off the vine, tree, bush, wherever. When we went out to my dad’s house for Father’s Day he had a little surprise for us. His cherry trees were in full bloom and ripe for the picking! 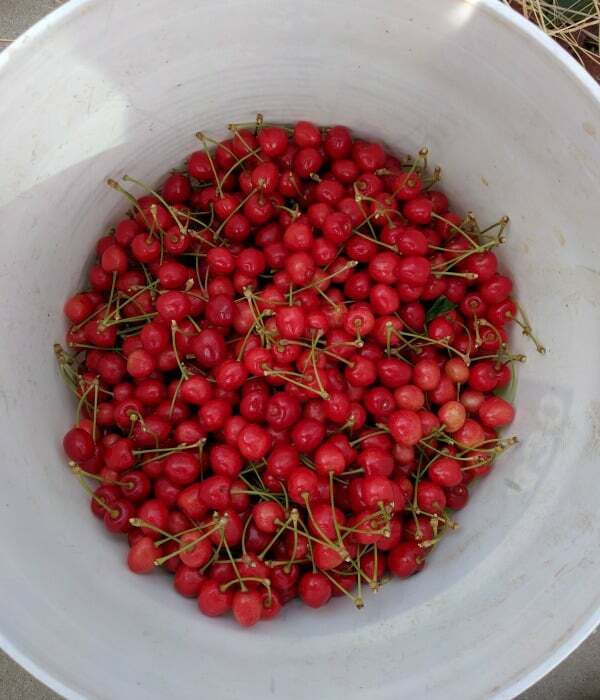 The boys and I had so much fun picking (and eating a few) cherries we probably spent an hour just on the one tree. After we filled up two buckets I thought we had gotten most of them off the tree. I was wrong; we probably only got a third of what was on there! We split the cherries with him and took home a whopping 15 pounds of cherries!! What was I going to do with 15 pounds of cherries?! Of course we ate a few, shared with friends, made a few pies and tarts but we still had more left and I didn’t want them to go bad. That’s when I remembered how much I love cherry limeade. Every recipe I had ever seen or tasted always used grenadine for the cherry flavor, never real cherries. 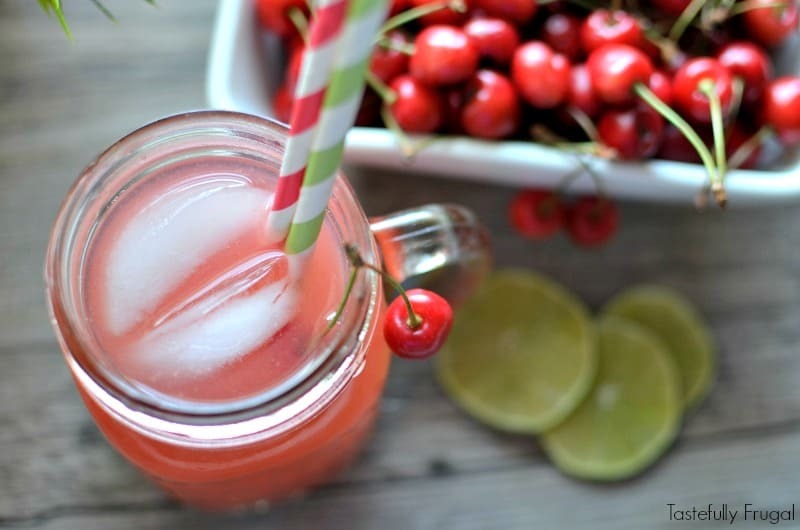 Who needs grenadine when you’ve got a bowl full of fresh cherries?! That afternoon I got to work pitting the cherries. A cherry pitter definitely comes in handy when you’re pitting that many cherries; it’s so easy to use I let my boys do most of the work. I let them help a good majority of the limeade making process and they had just as much fun making this as they did picking the cherries. I love the way this limeade turned out! It’s not as sweet as when you grenadine; well I shouldn’t say it’s not as sweet. It’s still sweet it’s just a different kind of sweet. The first taste is just like biting into a sweet cherry and then you get the tart hint of lime. 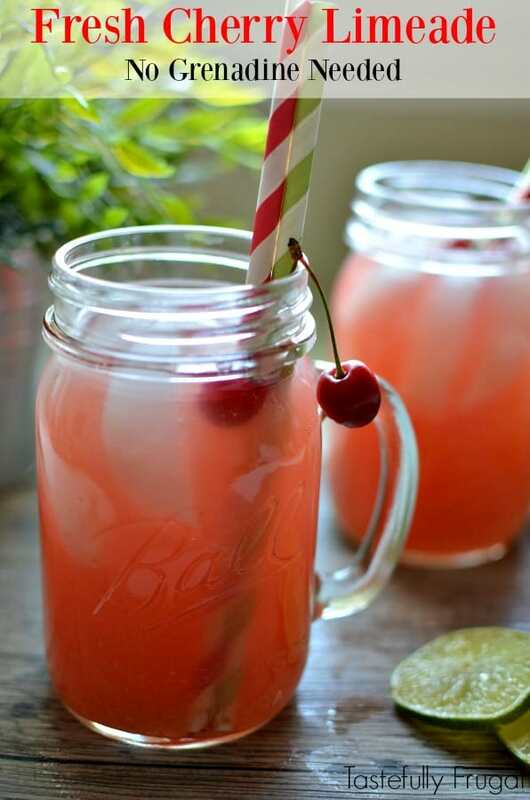 It’s the perfect combination for a cool drink! Bring water and sugar to boil in a large saucepan over high heat. Reduce heat to medium low, add cherries and let simmer for 5 minutes. Pour through a fine sieve and save liquid. Whisk liquid together with lime juice and let chill in fridge for at least 4 hours; overnight is best. 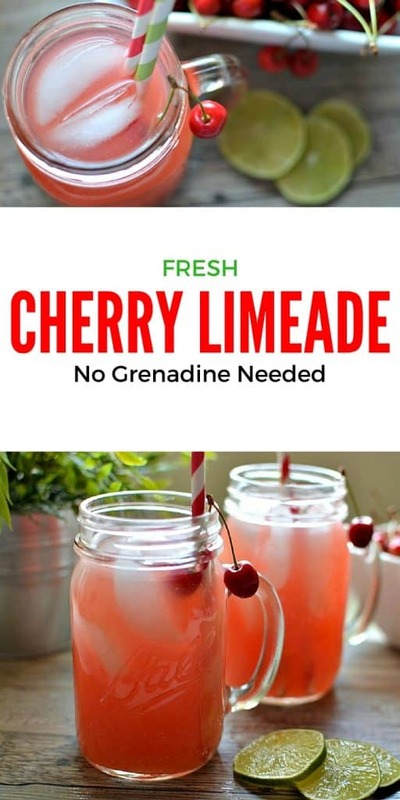 So if you’re at the farmer’s market or grocery store and you see pie cherries (or tart cherries) buy a few and make some fresh cherry limeade. It’s the perfect way to cool down on a hot summer day! Since I was a child I really love cherries. This refreshing drink makes me remember my childhood days. Fun. Family. Food!